I had a bimalleolar fracture 8 months ago which required ORIF (Open Reduction Internal Fixation) with 6 screws and plate. I had very limited dorsiflexion of the ankle after physical therapy for months and the plate/screws were very superficial (causing discomfort). It was thought that I had an anterior bone spur on the tibia limited the dorsiflexion (by xray)therefore repeat surgery was performed last week to have the plate and 5 screws removed as well as the bone spur (which was unable to be found). 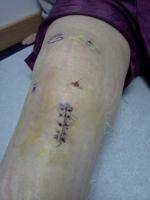 Note was made of alot of scar tissue which was removed. Presently one week after surgery I have exquisite pain in my foot and tenderness with swollen and extremely tender extensor tendons of my foot. Is this to be expected or what should I expect. I feel like I have went from one problem to another. I do have increased dorsiflexion from O to 10 degrees.